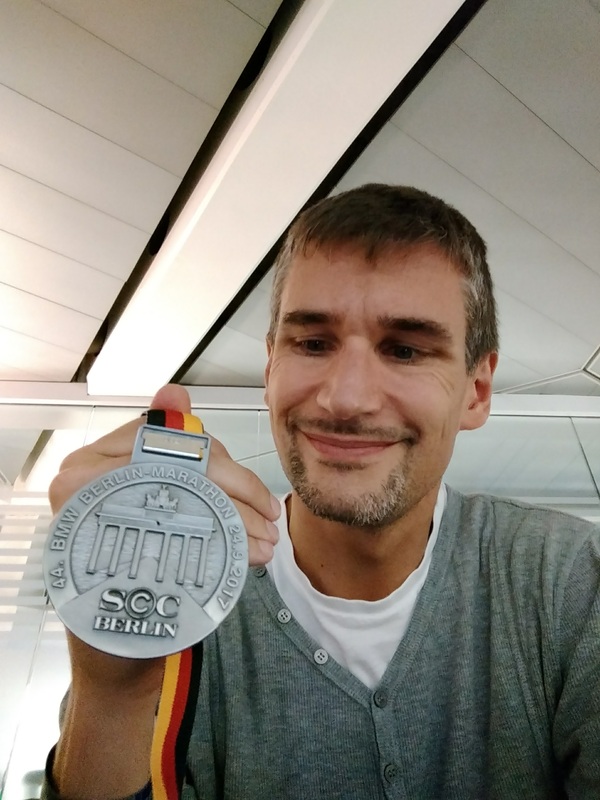 Berlin Marathon 2017 - Race Report - Run. Bike. Code. 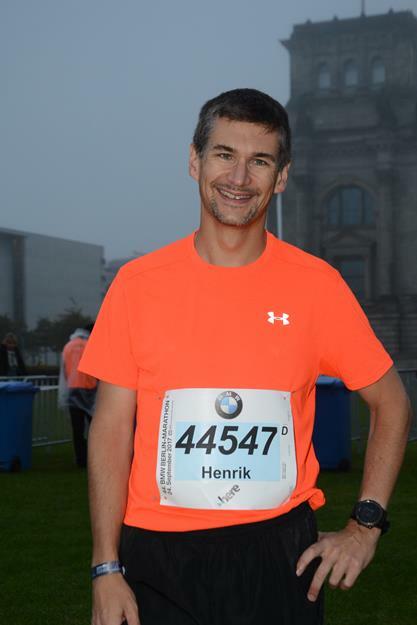 It’s been well over six weeks now that I ran the Berlin Marathon. This was my fourth marathon, and it will be the first one where I actually write a race recap. My recent accident gave me time to finish it, even though typing one-handed is rather slow. The beauty of running a domestic race is that travel is a no-brainer. In order to make the day before the race as relaxed as possible I had decided to fly to Berlin on Friday evening after work. The flight was uneventful if you ignore the slight delay. Since I had no other plans for the night I wasn’t worried about that though. Travel from Berlin Airport to the hotel was super easy and cheap 1. As I had already eaten in Munich there was nothing left to do than to make sure to get a good night’s sleep. Sunday race day means Saturday shakeout. As the hotel was right on the corner of the marathon course I decided to do my shakeout run on the last two kilometres of the course. This turned out to be a very good decision, as the course towards Brandenburg Gate is quite twisty with lots of 90° turns. That is certainly something to be prepared for when you’re desperately looking for the finish line in the final stage of the race. After a quick shower I headed down to get a big breakfast. It always surprises me how many runners show up in full running gear for breakfast. What’s wrong with going back up to your room and change afterwards? It might cost you five minutes but makes you much more decent to look at. Oh well, each their own, I guess. A little later than originally planned I finally headed to the marathon expo. At 11am the lines at the entry were already quite long, but the process to get the race package with one’s bib was well organised and efficient. I grabbed my bag and opted to not get any Adidas-branded pictures with my bib. The queue was just too long. I have to say, for the size of the Berlin Marathon with over 30,000 participants I was underwhelmed with the layout and size of the expo halls. Everything was narrow and full of people, quite a zoo. I was already almost back out of the chaos when I remembered that I had bought the official race T-shirt at registration. Alas, there was no T-shirt in my bag. So, in I went again, all the way to the back of the expo to grab my shirts. And for the second time I had to make my way through many people towards the exit. After leaving the crowded marathon expo I set into a routine that had worked very well for the Chicago marathon in 2015. First order of business: get food. I opted for an asian place that had decent reviews and was easy to get to. Lunch consisted of a mild chicken-curry with lots of rice, ginger-lemon tea and orange juice. I’m not a big fan of carb-load-parties the night before a race, I rather get some big lunch and then a small snack for dinner. Seems to work for me, so why change? After lunch I went back to my hotel room in order to relax, feet up and always hydrating. Soon enough it was time for a final pre-race call with coach Scott. While we did have an hour-long, very detailed call during the week already, this call was just a once-over on all important things. We touched on the weather, nutrition, pacing and – most importantly – mental preparation. This call left me confident that I was perfectly prepared for this race, the only thing left to do was execute. We concluded that the weather forecast would result in an A- weather for race day: rain in the early morning, but dry and overcast at start time with temps around 55-60F and negligible wind. Almost perfect. The call ended just around 5pm, about the right time to make my way to the movie theatre. Yes, I was trying to replicate my Chicago pre-race day, and back then I went to see “The Martian“. Going to the movies is a great way to kill some hours and distract your mind without spending time on the feet, pacing around in a hotel room. This year, I opted to see “American Made”, quite entertaining. In the end, it doesn’t really matter much what movie to watch, as long as you stay away from popcorn and soda, and actually chose the early screening. Around 8pm I was back in the hotel, ready to do the final preparations. I spent the next hour filling five bottles with Skratch Labs hydration, marking them with my bib-number, aid-station number and some stickers to make them recognisable. I then laid out all the clothes and gear, double-checked everything and went to bed. The alarm went off at 5:15am. For the night before a race I slept remarkably well. At around 6am I went down to the breakfast – thank you, Hilton Berlin for opening up the breakfast buffet an hour early for us marathoners. Since the start was over 3 hours away I opted for the full stack. Eggs, bacon, croissant, pancakes, a roll with honey, tea and orange juice. The weather didn’t care about that A- forecast, it had other plans. It had rained all night long, the streets were wet. What’s more, there was a good 95% humidity in the air. I left the comfortable hotel earlier than a 9:15am start would normally dictate as I had to drop off my hydration by 7:30am. A short 15 minute walk later and that was taken care of. Which left me with two hours to kill before the start. Bag drop-off and warm-up were the only things2 left to do in that time. As with any previous marathon, I had again managed to not bring anything to sit on. I’m always optimistic about the weather, this time though it didn’t really work out. Necessity is the mother of invention: I found an ashlar under a tree to sit on and used my still empty finisher plastic bag as an underlay. Not the most comfortable place, but reasonably dry and – most importantly – a place I didn’t have to share with others. The optimal state for any race lies between relaxed and excited. I knew that excitement would raise naturally right before the start, therefore I focused on relaxation while I sat on the stone. My daily meditation routine is generally not very consistent. That’s why I am proud to say that I managed to get a solid five minute meditation done – in the midst of nervous runners. Thereafter I ate one last Picky Bar, finished my pre-race hydration bottle and changed into my race outfit. The bag drop-off was quick and easy, and I began the trot through the park towards the start corrals. Halfway there, I spotted runners doing warm-up drills. Oh hey, warm-up drills. It hadn’t crossed my mind to plan for those, even though I do have a nice routine for that. I recently added dynamic warm-up drills (different from what I used to do) on coach @scottfishman's suggestion to all of my runs. These don't need a lot of time (less than 10 minutes, more like 6) and make a ton of difference to how I feel on the first few minutes of my run 💪🏻. . Added bonus of having a gym at work: when it's raining ☔ outside, I can at least do the drills inside. As there was still plenty of time I quickly joined them and did my own drills. I’m glad I took that opportunity, as the start corrals were packed already as I found out soon after. I took my spot in corral D shortly after 9am and waited for the elite start at 9:15am. Among other things the announcer offered an update on the weather: 99% humidity with a chance of rain. The streets certainly wouldn’t dry off. The elite runners went off on time and – surprisingly – the corrals after them followed in quick succession. Exactly 2:32 minutes after the elites I crossed the start line. This is surprising in hindsight, because the streets in front of me were crowded. For the next 11km / 7mi I constantly passed runners. During those early miles I was never able to hit my goal pace of 4:13/km (6:46/mi). As I was never far off from the ideal pace, I didn’t let myself get frustrated. I stayed patient and focused on the blue line to run the optimal course. To add insult to injury it rained for about ten minutes forty minutes into the race. Between 11km and 29km the streets cleared up and I found a great rhythm, ticking off splits right around goal pace. I don’t have a good recollection of the route or any sights I might have missed as I was absolutely zoned into my running. Sometime after crossing the half marathon (1:29:27) I noticed three London Adidas Runners in front of me, easily recognizable due to the typical AR singlets: Ayọ, Tomás and Ian, as I later found out through the magic of the internet (thanks, Instagram and Strava!). I knew that the ARs Berlin had a strong presence in the race and consequently many cheer zones. Thus I decided to tuck myself in behind the three London ARs, running in their wake. Boy did the cheer zones not disappoint: whenever the three London AR jerseys passed one, the crowd went crazy and I piggybacked off of that. We even got a nice confetti-cannon blast! So far in this writeup I haven’t mentioned any goal time, just a goal pace. This was a change to previous races that coach wanted me to implement. I have to say it felt really good to just focus on running one kilometer in the right pace, and then the next. If I hit the bullseye, great. If not I didn’t worry and just focused on the next kilometer ahead. Another mental weapon I employed for the first time was to dedicate laps (kilometers, in this case) to important people. People who are near and dear to me, who inspire me, and who played an important role in this marathon preparation. What a fun game to play! At a 4:13/km pace there is just enough time to think about a person, what it means to me and, potentially, what they have had to overcome in their life. And then – beep – it is already the next person’s turn. Of course, my closest family appeared more than once in the rotation. I played this game from shortly after the halfway mark well until 37km. After that I felt I needed all my mental energy to run in good form and finish strong. As mentioned earlier, I had dropped off five bottles with my own, tried and tested, hydration. It alway surprises me how few (relatively speaking) runners take advantage of that offer. I find most race-provided electrolyte drinks disgusting, plus I don’t know how my body will react on it. No fun in finding out on race day at 5km that you can’t stomach the provided drinks. In addition to these prepared bottles my nutrition consisted of six packs of gel that I carried with me. I had made a specific plan (reviewed and approved by my coach) for nutrition and hydration, and carried that on a small piece of paper with me. Not taking any chances! It all worked out really well except for one bottle at the 25km aid station, which I couldn’t find. I opted for water instead and didn’t worry too much. At km30 though I made extra sure to get my bottle. I slowed down at the tables with the athlete-provided hydration and still almost missed my bottle again. I was slow enough to make a quick stop though (luckily no one was behind me), turned around and grabbed the bottle. Probably the biggest sign of my mental strength in this race was that I didn’t let any mishaps like the missed bottle get to my head. I just quickly assessed the situation, chose an alternative (grab water) and marched on. That’s also what I did when my bib started to rip out from the safety pins. I don’t understand why SCC Events had chosen thin, non-waterproof paper for the bibs, but mine (and a couple of others that I saw) started to rip with about 10km to go. First the hole on the top right went. Then, soon after, the top left hole went. At that point I considered my options: wait until it completely rips of, potentially having to stop to pick it up. Or rip it off myself and carry it in my hands for the rest of the race. I went with the latter option, shaking off a short moment of annoyance, and continued on. A bib where it doesn’t belong. I guess my hydration plan was designed for exactly 40 kilometers, or maybe it was the missed bottle at 25km after all. Just two kilometer shy of the finish line I was suddenly thirsty. Luckily there was an aid station at kilometer 40. I took the time for a quick stop to properly drink a cup of water and one cup of tea. It has probably cost me a good 30 seconds, but it might have saved me a strong finish. Passing my hotel shortly after 40km put a smile on my face because I knew I was close to the finish. I took the now familiar turns towards the Brandenburg gate, this time running right through it. In order to get at least some decent finisher pictures I made sure to hold my bib in such a way that the number was readable. Quite an awkward pose to run in. I crossed the finish line in an official time of 3:01:26. That is an improvement of almost eight minutes compared to my Chicago Marathon time of 2015. I’m proud of that time, as it reflects an almost perfect race. 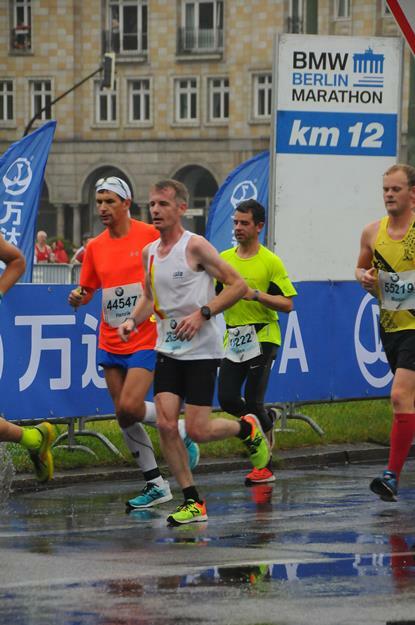 I’ve lost some time at the last aid station and the wet roads certainly had an effect on the time, but other than that: my Berlin marathon was a perfect race. I ran mentally and physically strong throughout the race. Many people have since asked me whether I’m disappointed that I didn’t run under three hours. No, I’m not. I know I will run under under 3 some time soon. I’m just very happy about the way I executed this race. Running an almost perfect race is no small feat. And granted, I did the running on my own. But the marathon is much more than just the 42.195km on race day. It’s the weeks and months of preparation that precede the actual event. And this preparation would not be possible without the support and help of many people around me. First and foremost, I have to thank my wife Steffi and our kids for their support and encouragement. They understand that my Sundays are sometimes slower after an early morning long run of 2:30h. They accept double run days without a blink. They lift me up after tough days. They surprise me with special “good luck” notes in my marathon bag. They are the best. Second, I have to thank my coach Scott Fishman for the spot-on preparation, again and again. 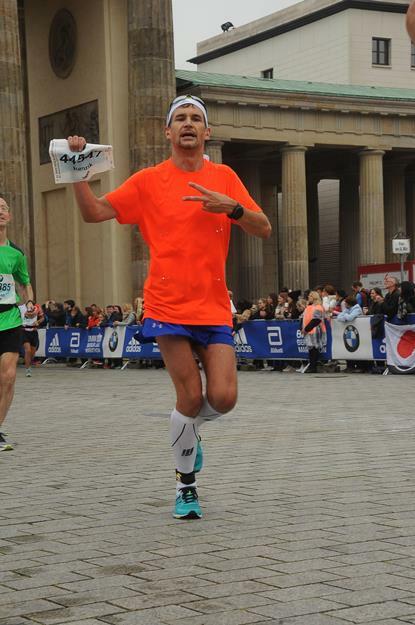 He encourages me to learn from every race, and especially in Berlin this payed off big time. Big kudos also to friends and family who always cheer for me and track my progress online. Knowing that people care about what I do gives me an extra push when I need it. Lastly, my running communities in real life and in various online communities (Instagram, Strava) deserve a lot of credit for supporting and pushing me. Who would have thought that people I haven’t met in person could become an important part of my running journey? Reflecting on a great accomplishment. It took me a while to finish this race report. It probably took you a while to read, thanks for sticking with it. Let me know if I should retro-recap my Boston 2017 marathon experience, leave a comment below. I will probably never understand how other cities than Munich get travel to their airport cheap and quick. Or at least cheap. Travel to MUC is long and expensive. That, and the visit to the porta-potty. It’s not a race recap if the porta-potty isn’t mentioned, right?